Lars Schubert is founder and Managing Director of graphomate GmbH. graphomate develops extensions to implement the IBCS® add-ons with SAP Analytics tools: SAP Lumira, SAP Business Objects Web Intelligence and SAP UI5 as well as MS Excel. graphomate charts and graphomate tables are one of the first IBCS® Certified Software products. Lars has a degree in Business Administration at the University of Cologne with focus on production management as well as planning and logistics. He has been trained in industrial management at Siemens AG. 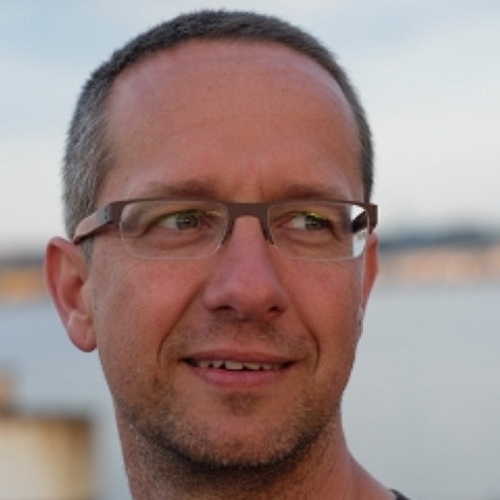 Before founding graphomate GmbH, Lars has been working as a Financial Controller and Project Manager for SAP BI in the consulting, production, and banking segments. Today he focusses on the visualization of information with SAP Analytics tools: SAP Lumira, SAP Business Objects Web Intelligence and SAP UI5 as well as MS Excel according to IBCS®. 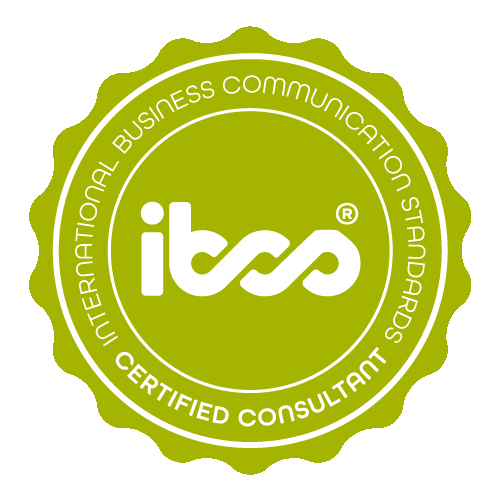 Lars Schubert has successfully completed the IBCS® certification for successful design of reports and presentations at the HICHERT+FAISST IBCS Institute in October 2010. 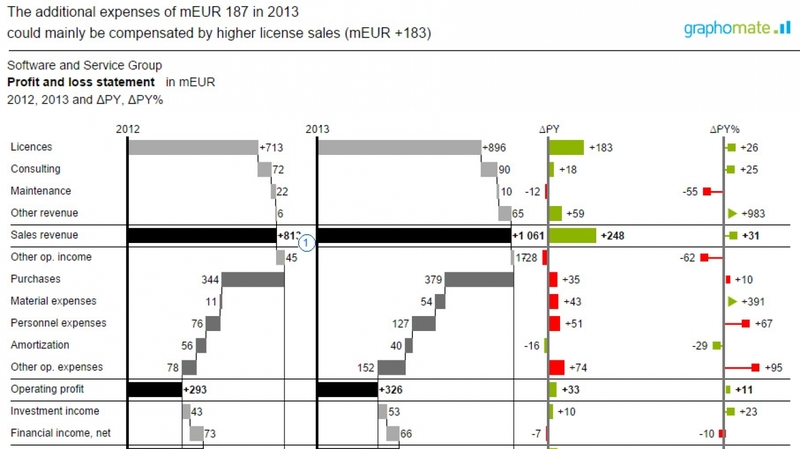 All examples are implemented by using graphomate charts and graphomate tables and SAP Lumira Designer. Videos about graphomate products can be found on graphomate.com. Grouped column chart This example serves to represent a key figure - the Contribution Margin - over time according to IBCS® scenarios. The deviations can be interpreted without any legend since both the chart elements and the axis represent semantics: Hatched chart elements on a gray axis show the absolute deviation of forecast values compared previous year values. Return-on-asset (ROA)-Tree in Lumira Designer This tree structure shows the subcomponents of the return-on-asset over time. 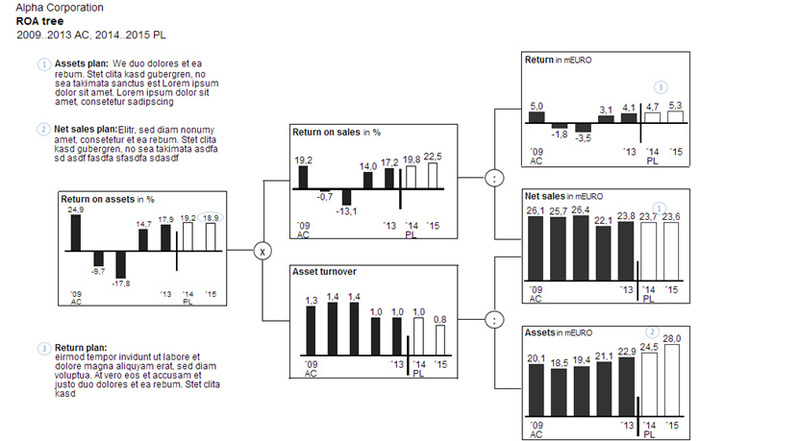 The tree itself was realized by simple graphic objects in Lumira Designer, while the diagrams were generated with the graphomate charts add-on. Again, you recognize actual values - black - and plan values - hollow. Particularly noteworthy are the different widths of the chart elements for mapping base and ratio measures at this point. 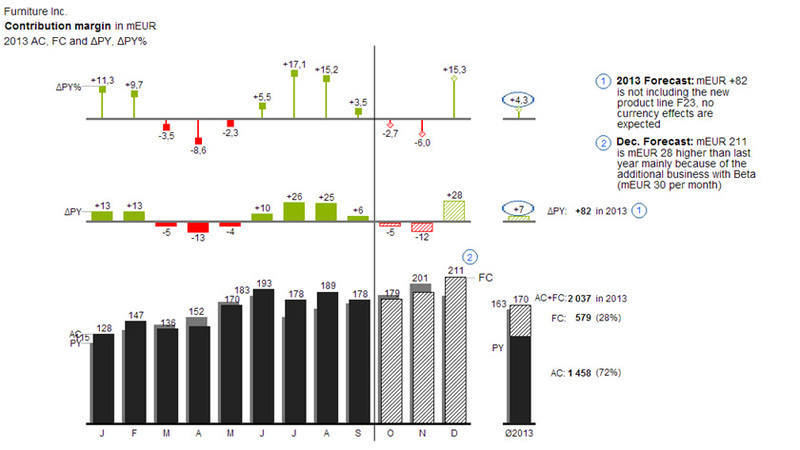 Income statement as a waterfall in Lumira Designer The IBCS®-typical representation of a comparison of two fiscal years: profit & loss components of the current and the previous year are shown as waterfall charts to represent their impact on the overall result and their structure visually. Deviation charts as small multiples in Lumira Designer In this example, the same scaling across all charts is important. 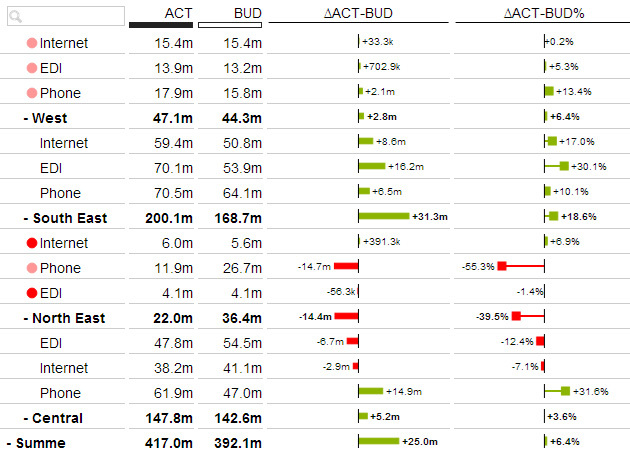 This is solved with graphomate charts by assigning an identical so called "Comparison Group". In this way, the visual impression is correct and the charts are visually comparable. Table with deviations and alerting for Lumira Designer graphomate tables allow together with graphomate charts the establishment of IBCS®-compliant reporting. The graphomate tables enable interactive analysis across multiple dimensions, which are represented as a hierarchy. Deviations can appear as small (Incell-)charts. graphomate, founded in 2010, is a software provider based in Kiel with a clear goal: to provide decision-makers with simple and clear visualizations that support the decision-making process clearly and definitely. True to the motto: informing instead of decorating. graphomate products focus on the rules of good information design according to IBCS®. graphomate focuses on the development of visualization solutions for SAP Analytics: SAP Lumira, SAP Business Objects Web Intelligence and SAP UI5. graphomate also provides an add-in for Microsoft Excel to easily map the IBCS® standards along with SAP Business Objects Analysis, Edition for office. Since 2011, graphomate is a SAP PartnerEdge Build Partner.